This is a cover of mini-notebook for selling in con. I love that anime! Anyway, I really like the papery look this has and they're both so cute. They're going to have a 3rd one. it comes out this summer! *waves hand around in air* I love this manga/anime! ^^ nice anime, good job! 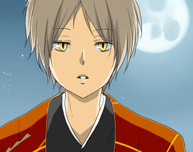 Cute Natsume ever .-. I should watch the anime. Thanks ! watch it watch it!